HORSE PENS 40 PARK ---- Steele, AL. "The South's Best Kept Secret"
"The Home Of The South's Bluegrass Music"
TO SEE OUR NEW WEBSITE ! We appreciate your interest in Horse Pens 40! Horse pens 40 is a historic outdoor nature park, a natural wonderland of unique rock formations nestled atop Chandler Mountain in the foothills of the Appalachians. 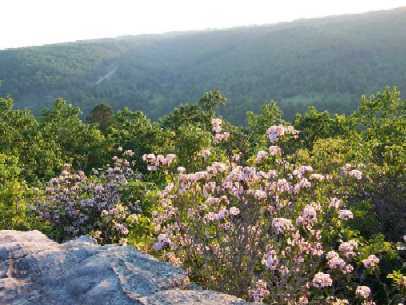 Located on top of the third highest mountain in Alabama at 1500' above sea level, it is blessed with a moderate climate that allows everyone to enjoy it's beauty year-round. The stone formations here are said to be among the oldest naturally exposed stones in the world, dating from 600 million to 1.3 billion years old. There are over 60 rare, threatened, protected, or endangered species in the park, and because of this, our goal is to protect all native species here as if they are an endangered species. NOTE: Due to it's very fragile ecosystem, HP40 is a "LEAVE NO TRACE" nature park and all guests are expected to do no damage to anything while they are here. No level of damage to any plant, creature, or natural feature here is acceptable or willingly tolerated. 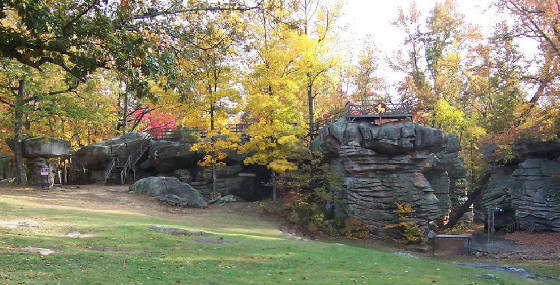 There has been over 15,000 years of human habitation in the natural rock shelters located in the park. Humans have used this area as a place of sanctuary and spiritual renewal for many thousands of years, and continue to do so to this day. The park also contains ancient Indian burial grounds dating from the earliest inhabitants of this area, all the way up to the time of the Cherokee removal known as the "Trail of Tears". 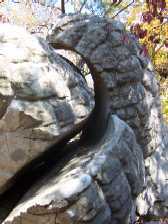 The Creek and Cherokee tribes at various times used the natural rock formations to trap and corral horses, as a natural fortress in times of war, and as a shelter and ceremonial area in times of peace. (The only Peace Treaty ever signed between the Creek and Cherokee nations was signed here at Horse Pens 40). During the War of Northern Aggression, the folks from the lowlands brought their children, horses, possessions, and valuables here to hide them from both the Yankee invaders and the Confederate recruiters and 'Bushwhackers'. Discovered by the Confederates, it was then used for storage of supplies to be distributed to Confederate troops as they passed nearby. 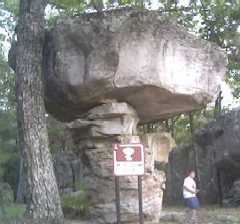 These rocks also contain several outlaw hideouts which were used for many years. The famous Alabama outlaw Rube Burrow had a hideout here, complete with a stable, hidden passages, and a secret stone door to allow for escape if necessary. In the 1880's, the area was settled by a young couple named Hyatt, who had come here from Georgia. The original deed refers to "the home 40, the farming 40, and the horse pens 40", each tract consisting of 40 acres of land. This is how Horse Pens 40 got it's name. Descendants of the original Hyatt family still occupy nearby areas of the mountain, and we consider ourselves blessed to have them as neighbors and friends. Around 1958, a newspaperman from Huntsville named Warren Musgrove discovered the acoustic quality of the natural amphitheater and developed the park as a venue for Bluegrass and Southern Gospel Music concerts, as well as local arts and crafts fairs, and other activities. In the early 1960's, Emmylou Harris made her first public appearance here, standing barefoot on a wooden door propped up on the rocks. (She was reportedly paid with a bowl of fruit for this performance). Since then, many have gotten their start here, such as Three on a String, Marty Stewart, and others. There have been many famous people to appear here, such as Charley Daniels, Ricky Scaggs, Lester Flatt, Bill Monroe, Ralph Stanley, "Doc" Watson, Norman Blake, Deacon Dan Crary, Ace Weems and the Fat Meat Boys, The Osbourne Brothers, Sam McGee, Red Clay Ramblers, and many more. During this period, the park was designated by the Alabama State Legislature as "The Home of the South's Bluegrass Music" (Ala. HJR177). It has since become known as one of the top bouldering destinations in the United States. 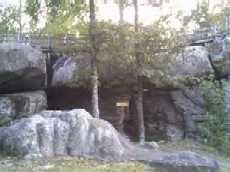 After some hard times brought on by the mismanagement of past owners, the Schultz family bought the park in order to restore it to its former place as a natural and historical park, a world class bouldering site, and as a premere venue for various special events, concerts, and bouldering competitions. We look forward to welcoming you to historic Horse Pens 40 and will do everything we can to make your stay a pleasant and memorable one. Hope to see you soon! Come and enjoy the astounding rock formations, the rare plants and animals, and the serenity and clean air atop the mountain at Horse Pens 40! The Schultz family and the Staff and Friends of Horse Pens 40 cordially invite you to come and enjoy the beauty of Nature and the great outdoors with us. Everyone is welcome to come walk the beautiful trails among the unique and amazing rock formations that gave Horse Pens 40 it's worldwide fame, while listening to the birds and enjoying the solitude and inner peace that can only be found up here on the mountain in the special place known as Horse Pens 40. Bring your picnic lunch or dine in our Country Restaurant which is open Friday thru Sunday. Both RV and primitive camping is available, with bathhouses, hot water showers, huge 50' x 120' covered pavilion, water and elec. hookups, and Country Store and Restaurant on site. HP40 has a New Phone Number ! ! Due to continuing difficulty with our antiquated, slow, and dependably unreliable phone service, we have been required to obtain a new phone line and also a new phone number. And even so our credit card machine seldom works properly...especially if it is windy, raining, clear, sunny, cold, warm, or anything in between. So, if you need to talk to someone here, call 256-538-7439. And, if you don't get an answer, it doesn't mean that we aren't here, we are probably just outside in the park. Keep tryin' til you get ahold of somebody, or just come on up to see us. Thanks, and we apologize for the inconvenience. due to insurance restrictions and important ecological considerations, (There are over 60 rare, threatened, protected, or endangered species at HP40) we have been forced to adopt a STRICT NO PETS policy. PLEASE LEAVE YOUR PETS AT HOME ! ! NO PETS ARE ALLOWED (outside your vehicle) ANYWHERE AT HP40 EXCEPT IN THE LARGE FIELD OUTSIDE THE MIDDLE GATE. There are many rare, threatened, protected and endangered species here, and all are potentially vulnerable to canine (and also careless human) impact. While we love dogs, they can't really make a positive contribution to a nature park, and cannot possibly benefit the creatures that live here. We also expect our human guests to LEAVE NO TRACE while they are here. We appreciate your consideration on this important issue, and we apologize for the inconvenience it will cause pet owners. PLEASE LEAVE YOUR PETS AT HOME!! HORSE PENS 40 IS OPEN 7 DAYS A WEEK !! Water / Elec. RV hookups ---------------- add $5.00 extra per RV per night. GUESTS UNDER 18 MUST HAVE A PARENTAL WAIVER ON FILE (available upon request through e-mail at horsepens40@aol.com. ALL MINORS MUST BE ACCOMPANIED BY AN ADULT. MINORS MUST BE UNDER ADULT SUPERVISION AT ALL TIMES !!! NO GLASS CONTAINERS ALLOWED IN PARK !!! PLEASE DO NOT BRING GLASS TO HP40 !!! Pets are no longer allowed at HP40 (outside your vehicle). We do allow registered guests to exercise their dogs in the large grass field outside the campground gate. BB GUNS, PELLET RIFLES, OR SOFT-AIR TYPE GUNS ARE PROHIBITED ON HP40 PROPERTY. THIS IS STRICTLY ENFORCED !!!! We feel that there is no place for these items in a nature park where all living things are strongly protected. The potential for injury or damage Is simply too great, including the fact that the lead and plastic pellets are potentially harmful to wildlife and are NOT BIODEGRADABLE, effecting the environment for many years. Please use these items elsewhere in a safe place and in a safe manner, and be environmentally responsible and use a target that recovers your pellets. ALL HP40 PRICES REFLECT A 10% DISCOUNT FOR CASH THAT CANNOT BE OBTAINED THROUGH THE USE OF ANY OTHER FORM OF PAYMENT. and INCLUDE 6% ALA SALES TAX *. Children under 10 are FREE! (with paid parent). Camping is $13.00 per person per night/day (1 night and 1 day - sundown thru sundown the next day). Camping is $15.00 per person per night/day (1 night and 1 day - sundown thru sundown the next day). Our winter rates (which also already include the 6% sales tax) reflect the higher costs of winterizing, maintaining, and operating the park throughout the colder winter months. FAMILY and GROUP RATES ARE AVAILABLE ! Call the office for details or inquire at the office at check-in. Minors (under 18) not accompanied by a parent or guardian must have a parental waiver on file to enter the park. Rustic Cabins are $50 per night for 1 or 2 people, (add $20 per additional person per night). Reservations are recommended for rustic cabins. Reservations are not accepted (or needed) for primitive camping. Elec. and water RV hookups are $5.00 extra. (10 punches per card) which are usable for many HP40 services, such as day use fee (1 punch), primitive camping (2 punches), Rustic Cabins (4 punches, 2 persons min., some restrictions apply), Crash pad or shoe rental (1 punch), firewood (1 punch per bundle), and more! This discount card amounts to only $6.50 per day or $13.00 per night !! The discount card lets you get the summer rate all year long !! We have clean restrooms and shower facilities, a large (50' x 120') covered pavilion, as well as a Country Store and Restaurant. There are also special events scheduled regularly, such as various Concerts and Festivals, Bluegrass Music festivals, Native American Events, Mountain Arts and Crafts, Motorcycle Rallys, and many more. We also host corporate picnics, family reunions, outdoor weddings and other special gatherings. Country Store open 7 days a week!! Restaurant Open Friday thru Sunday!! Horse Pens 40 is always closed to incoming day users and campers on Easter Sunday, Thanksgiving, Christmas Eve and Christmas Day. If you are already camping here and are paid up through the holiday, you may remain and enjoy the park. The Country Store and restaurant will also be closed on the above holidays. Reservations are not accepted (or needed) for camping. NO PETS ALLOWED IN CAMPGROUND, ROCK AREAS, OR NATURE AREAS!!! PLEASE LEAVE YOUR PETS AT HOME !!! Legal notice: HP40 management and staff reserves the right, solely at their discretion, to refuse, curtail, revoke, or deny any admission, discount, or service to anyone at any time, for any reason, with no reason required to be stated. According to the situation causing the action to occur, and the attitude of the parties involved, a refund may be denied or not offered. 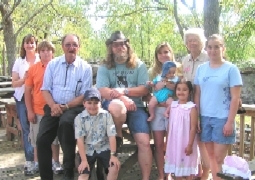 All admission fees, user fees, camping fees, discounts, group rates, or any other rates or services are offered or accepted solely at the discretion of HP40 management and staff, and may be changed, ended, revoked or denied at any time, with no reason required to be stated, with or without a refund given.